Pitfall on the way to a new Neo Plasticism, Westkapelle, Holland, 1971 C Type Print 40 X 29.5cm. © Copyright the Estate of Bas Jan Ader / Mary Sue Ader Andersen, 2016 / The Artist Right’s Society (ARS), New York. Courtesy of Meliksetian | Briggs, Los Angeles and Simon Lee Gallery, London. Simon Lee Gallery is proud to announce a solo exhibition of work by Dutch conceptual artist Bas Jan Ader, one of the most influential artists of his generation. Forty years after the end of his brief career, his concise body of some thirty-five works created between 1969 and 1975 continues to inspire artists, writers, curators and critical thinkers. This exhibition includes five of Ader’s short ‘falling’ films, shown in their original 16mm format, alongside the key film from 1974, Primary Time. It also includes related photo works and the seminal work, I’m too Sad to Tell You, (1971). The works exhibited reveal the depth of Ader’s investigation into questions of control and its surrender to the forces of nature, particularly in relation to the creative process and strategies of composition. “When I fell off the roof of my house, or into the canal, it was because gravity made itself master over me”. In the film Fall 1, Los Angeles, (1970), the camera is focused on the front of Ader’s home in Claremont, with the artist sitting on a chair straddled across the top of the roof before falling and crashing into the garden. In Fall 2, Amsterdam, (1970), Ader framed for camera a section of the Reguliersgracht canal, a canal bridge, path and trees, with the wall of the canal bisecting the picture to provide a horizon line. Ader appears in the frame from a side street, gripping his handlebars with a bunch of flowers clutched in one hand before appearing to lose control of his bicycle and plunge into the water, along with the bike and flowers. The composition, and Ader’s precisely timed action reveals the tension between will and determinism, literally destabilising the subject in an attempt to extend the material limits of art. Ader also found in Mondrian, as the venerated patron saint of Modernism in the Netherlands, fertile ground for an interrogation of formal and compositional systems and strategies. Several works in this exhibition reflect his enquiry into Mondrian’s theories, and analysis of the modernist project. 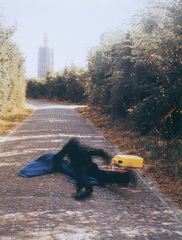 The film Broken fall (geometric), Wekstkapelle, Holland, (1971) sees Bas Jan Ader standing next to a black sawhorse, on a brick path leading to the Westkapelle lighthouse in Zeeland, the subject of an early series of Mondrian paintings. Ader’s position aligns him directly parallel to the lighthouse in the background. He momentarily staggers, then falls sideways against the sawhorse and into the bushes. The act recalls slapstick but also sees Ader literally embodying Mondrian’s black line, the sawhorse a reference to Mondrian’s fellow De Stijl member Theo van Doesburg, who introduced the diagonal into the neoplasticism debate. The film reveals a particularly concise opposition between the forces of nature and the logic of compositional control. The film Primary Time, (1971) begins with a vase holding a bouquet of primary colour red, yellow and blue carnations. After a few seconds Ader appears dressed in black, (with his head never appearing in the frame) and systematically begins to add and remove flowers until he has arranged an exclusively red, then yellow and finally blue bouquet, literally revealing his hand as an artist constructing and deconstructing the image. Between arranging each he disappears briefly and the film ends with a return to the three coloured bouquet. The series of twenty one photographs Untitled (Flower Work), (1974) utilises the same camera position as the film but comprises three series of seven framed images, with the final image an exclusively blue bouquet. In mixing these man-made natural forms, (a Dutch national symbol) as a painter mixes paint, Ader challenges Mondrian’s radical abstraction and suggests that it might never live up to the beauty of nature. Bas Jan Ader was born in 1942 in Winschoten, The Netherlands and lived in Los Angeles for the last twelve years of his life. He disappeared in 1975 in the North Atlantic Ocean under mysterious circumstances during the second part of what was to be his grand trilogy of works In search of the miraculous. He received his BFA from Otis College of Art and Design, Los Angeles and his MFA from Claremont Graduate School, California. His work has been shown extensively internationally and has been the subject of numerous solo exhibitions, including Museo d’Arte Moderna di Bologna, Bologna, Italy (2013); Museo de Arte Zapopan, Guadalajara, MX (2011); Centro Gallego de Arte Contemporanea, Santiago de Compostela, Spain (2010); Kunsthalle Basel, Switzerland (2007); Museum Boijmans Van Beuningen, Rotterdam, The Netherlands (2006); Camden Arts Center, London, UK (2006); Museo Tamayo Arte Contemporaneo, Mexico City, MX (2004); Portikus, Frankfurt, Germany (2003); Munchen Kunstverein, Munich, Germany (2000), which travelled to Bonner Kunstverein, Bonn, Switzerland and Kunstverein Braunschweig, Braunschweig, Germany.